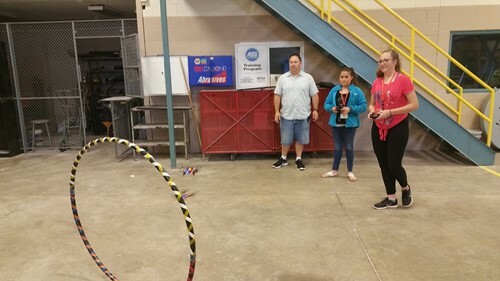 Students from several local middle schools who will be entering the 7th Grade in August, took part in an exciting ESC program in collaboration with Buckeye Hills Career Center. The program, Career Palooza, has been active for several summers and includes experiences in various careers (like Cosmetology, Vex Robotics, Solar Energy, and Construction) provided by technical instructors. Almost 100 students attended this year's week-long program. Students enjoyed the fruits of their hands-on learning by taking home career-aligned projects they worked on as they rolled through a total of 12 different careers. The program culminated in a trip to King’s Island where the students had to track evidence of technical careers in theme parks. Students and their supervising teachers received a Career-Palooza T-Shirt; those students with perfect attendance throughout the week received a $25.00 gift card. (See our Photo Gallery for additional pictures of Career Palooza 2018). Career Palooza is one of many ways the Gallia-Vinton Educational Service Center contributes to the college-and-career awareness and readiness of area students.